An Insanity-Free Wedding: It Can Happen! The real purpose of engagement (hint: it’s not just about the planning) How to pinpoint what matters most to you and your partner DIY-ing your wedding: brilliant or crazy? Affording a wedding without having to cut your guest list How to communicate decisions with your family Why that color-coded spreadsheet is actually worth it Wedding Zen can be yours. Meg walks you through everything from choosing a venue to writing vows, complete with stories and advice from women who have been in the trenches, the Team Practical brides. So here’s to the joyful wedding, the sensible wedding, the unbelievably fun wedding! A Practical Wedding is your complete guide to getting married with grace. This is not a step-by-step how to on planning your wedding. This is how not do go insane while planning your wedding. 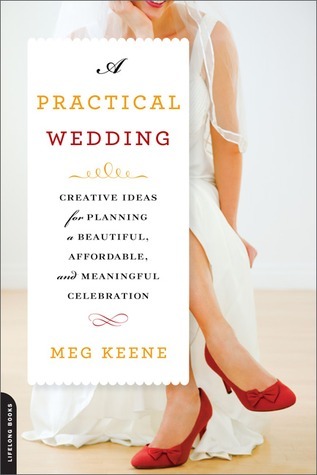 Meg's book encompasses the entire journey - from engagement to post-wedding. She gives you tips and advice on how to stay sane and keep everything in perspective. To be honest, I didn't read every section. The reason for these skipped sections is either because I'm beyond that point in my planning (venue picking, budget, vendors) or that it did not apply to me (DIY wedding). However, I did scan these sections and they seemed to be just as helpful/informative as any other section I read. Had I not been as far into planning as I am and had found this book a few months ago, I would have read each and every section. An aspect I found to be very cute when when Meg included stories, snippets, or quotes from other married couples in relation to each chapter. Having been married herself, Meg is well aware of the stress wedding planning can bring on, but to hear specifically from other brides regarding DIY, family drama, budget, tradition or the like is a nice touch. She also includes a list of resources you can use along with books she consulted in her research in case you want additional readings to ensure your sanity. While I enjoyed every section, I really liked the section on traditional. She debunks a lot of things people see as traditional when they've really only been around since the 1920s! White dresses, elaborate parities, church weddings - all those things came about in the time. Also, did you know the unity candle was "invented" in the 1970s for a soap opera!? If you are recently engaged or know somebody who is, this is the perfect book to read. Meg does an amazing job of putting things into perspective so that your wedding day will "be the happiest day of your life so far" (204).